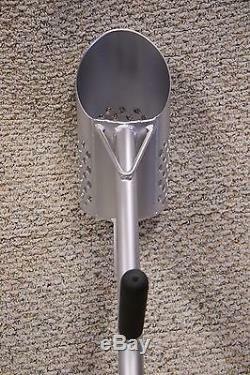 This is our new 6 inch diameter Perforated Aluminum sand scoop. 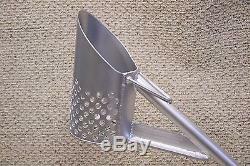 This scoop has 1/2 inches holes punched in the scoop sides for fast sifting of sand. This scoop features all TIG welded construction. 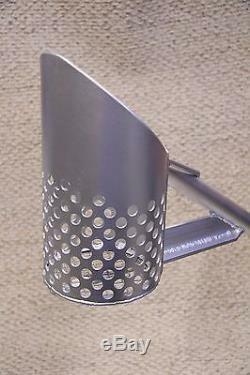 The bottom of the scoop has 1/2 holes punched into the aluminum. The perforated holes help this scoop sift wet or dry sand super fast. The scoop measures 6 inches in diameter and is 11 inches tall. The handle measures 40 inches long and has our comfortable 14 inch foam rubber hand grip. Welded on the handle is a second handle that is 13 inches up from the scoop also with our comfortable foam rubber hand grip. The second handle aides in lifting the scoop when its full of sand. The scoop is made entirely out of aluminum. The handle is 1 1/4 diameter and is made out of heavy wall aluminum. The back of the scoop has an extra reinforcing plate welded on for extra strength. Welded at the base of the handle is a support for extra strength for the handle. On the bottom of the scoop is a plate to allow you to push the scoop into the sand with your foot. This is a great scoop for dry or wet sand. We recommend using this scoop in shallow water not deep water surf hunting. This scoop weighs 5lbs 6 ozs. Made in the USA by Borderline Engineering. We custom make all of our sand scoops. 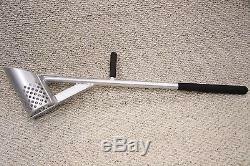 We can customize this scoop to suit your needs as well as make any custom scoop you may need. 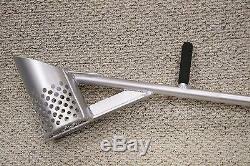 The item "Aluminum Metal Detecting Sand Scoop" is in sale since Friday, July 27, 2018. This item is in the category "Business & Industrial\Test, Measurement & Inspection\Test Meters & Detectors\Metal Detector Accessories". The seller is "borderlineengineering" and is located in Burbank, California. This item can be shipped to United States, Canada, United Kingdom, Denmark, Romania, Slovakia, Bulgaria, Czech republic, Finland, Hungary, Latvia, Lithuania, Malta, Estonia, Australia, Greece, Portugal, Cyprus, Slovenia, Japan, China, Sweden, South Korea, Indonesia, Taiwan, South africa, Thailand, Belgium, France, Hong Kong, Ireland, Netherlands, Poland, Spain, Italy, Germany, Austria, Israel, Mexico, New Zealand, Philippines, Singapore, Switzerland, Norway, Saudi arabia, Ukraine, United arab emirates, Qatar, Kuwait, Bahrain, Croatia, Malaysia, Brazil, Chile, Colombia, Costa rica, Dominican republic, Panama, Trinidad and tobago, Guatemala, El salvador, Honduras, Jamaica, Bahamas, Viet nam, Uruguay.